Michael Dugan, a native of St. Charles, Illinois, joined the music faculty at the University of Wisconsin-Whitewater in 2009. Dr. Dugan teaches applied trombone, directs the Trombone Ensemble, Jazz Ensemble II, and plays in the Whitewater Brass Quintet. In addition to his teaching duties, Dugan is an active freelance artist in the Upper Midwest. Recent engagements include the Milwaukee Symphony, Minnesota Orchestra, Saint Paul Chamber Orchestra, as well as many fine regional orchestras throughout Wisconsin and Iowa. 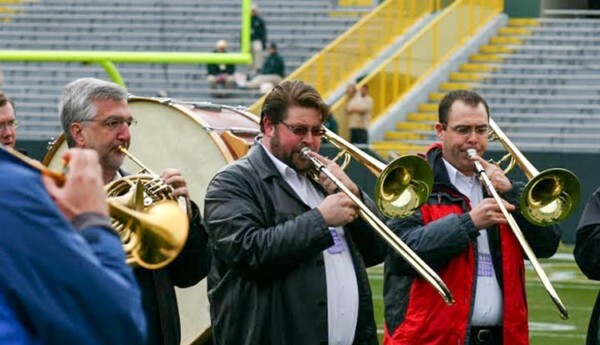 He is also a member of the critically acclaimed Isthmus Brass. Other recent performances include the San Francisco Ballet Orchestra, the Intergalactic Contemporary Ensemble, Thunder Bay (Ontario) Symphony, Elvis Costello, Audra McDonald, Doc Severinsen, Johnny Mathis, Irish Tenors, and The Four Tops in various capacities. During the summer of 2010, Dugan was a faculty member at the 2010 International Trombone Festival at the University of Texas at Austin. From 2001-2005, Michael was a member of the United States Air Force Band of Liberty. During his tenure with the Band of Liberty, Michael was the featured trombone soloist with the Concert Band and the Colonial Brass Quintet. His other performance assignments included the Band of Liberty Jazz Ambassadors and Ceremonial Band. Dugan’s formal education includes a DMA from the University of Minnesota, where he also holds a Master of Music degree. Prior to his study with Tom Ashworth at the University of Minnesota, Dugan received his undergraduate degree from DePaul University in Chicago, where he studied with Mark Fisher, Charles Vernon, and Edward Kocher. Other pedagogical influences include Ed Zadrozny, Kari Sundstrom, and Doug Wright.